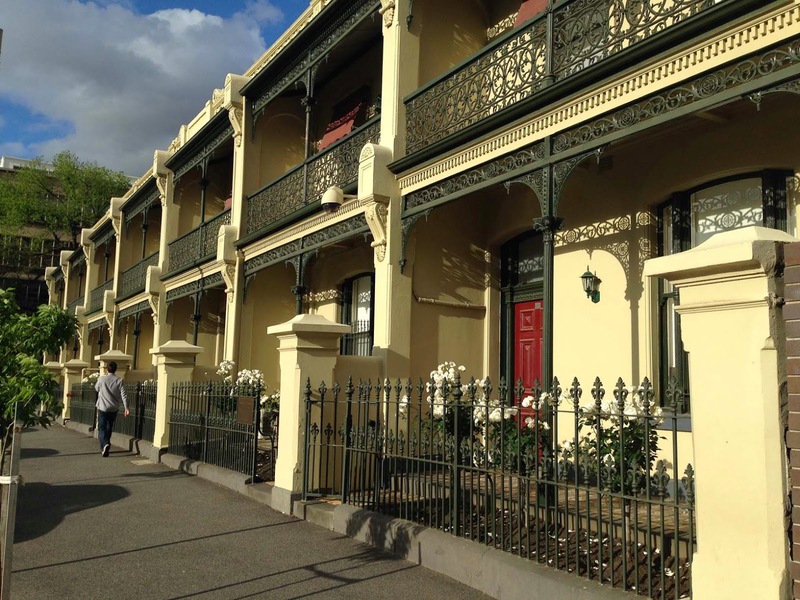 Just north of the Melbourne Central Business District, you can find some of the city's oldest, nicest neighborhoods: Carlton and Fitzroy. 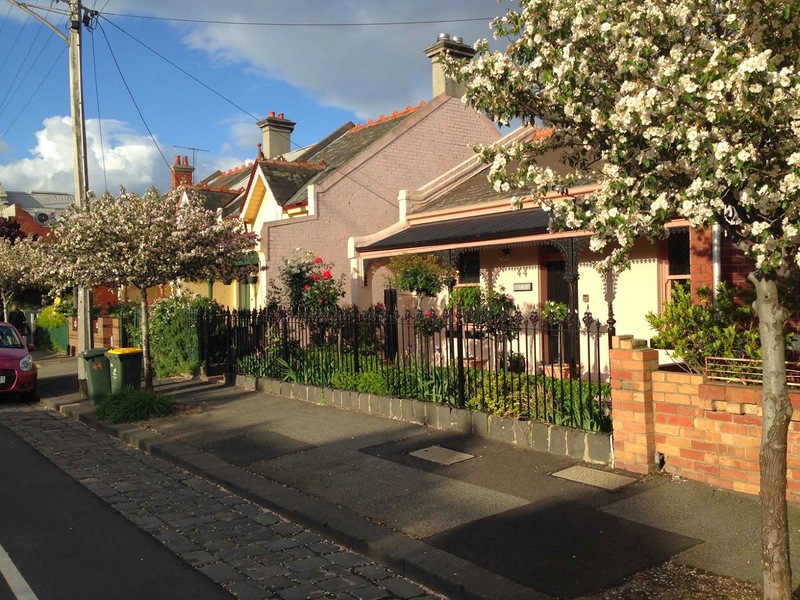 These quiet suburbs are full of pleasant streets lined with Federation-style row-houses, with leafy squares, the University of Melbourne campus and a few really big parks. The west half of this run goes through Carlton, the east half through Fitzroy. 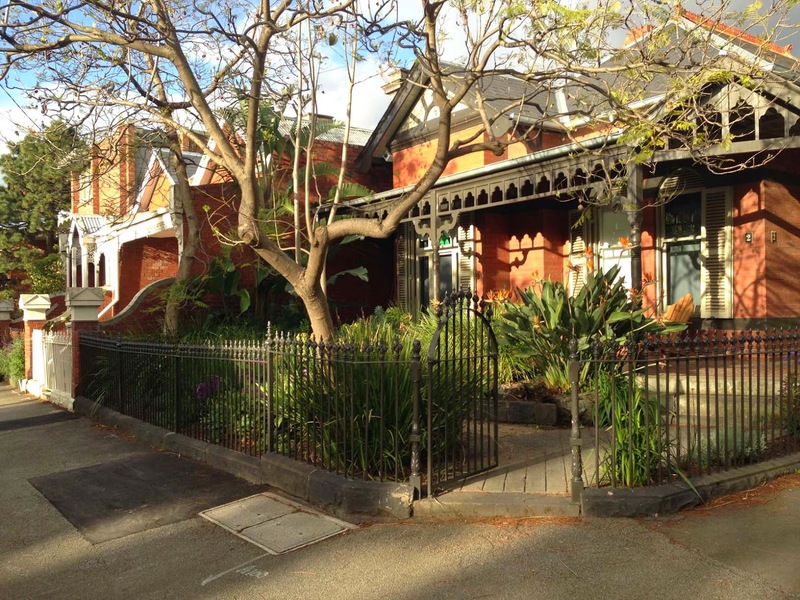 Carlton is dominated by two universities, a big park landscape and Little Italy. Fitzroy is Melbourne's oldest suburb, long a working-class stronghold, and now a hip nightspot with live music clubs, bars and quirky restaurants concentrated along Brunswick Street. There are a lot of off-beat shops, too. But the area is gentrifying and has its share of cafés and galleries. Here's a route that loops through some of the most interesting sights in both neighborhoods, while keeping to quiet streets and parks as much as possible. 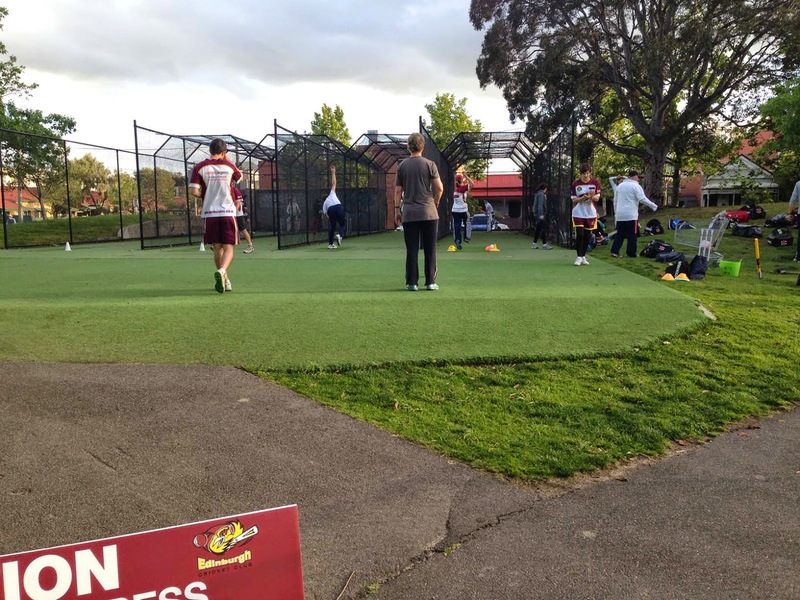 We'll start at Carlton Gardens on Victoria Street, at the northeast corner of the city center. This shady park sits on the boundary between the two neighborhoods. The La Trobe tram stop is right at the main entrance to the park. We'll head westwards first, through Carlton, then loop clockwise to the north then eastwards to enter Fitzroy before returning. 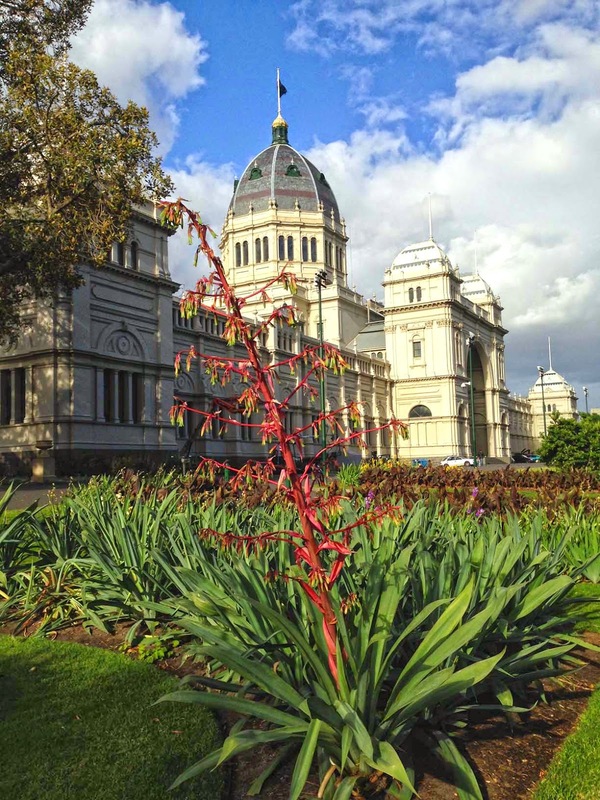 So, ready to explore this down-home side of Melbourne? Then, off we go! 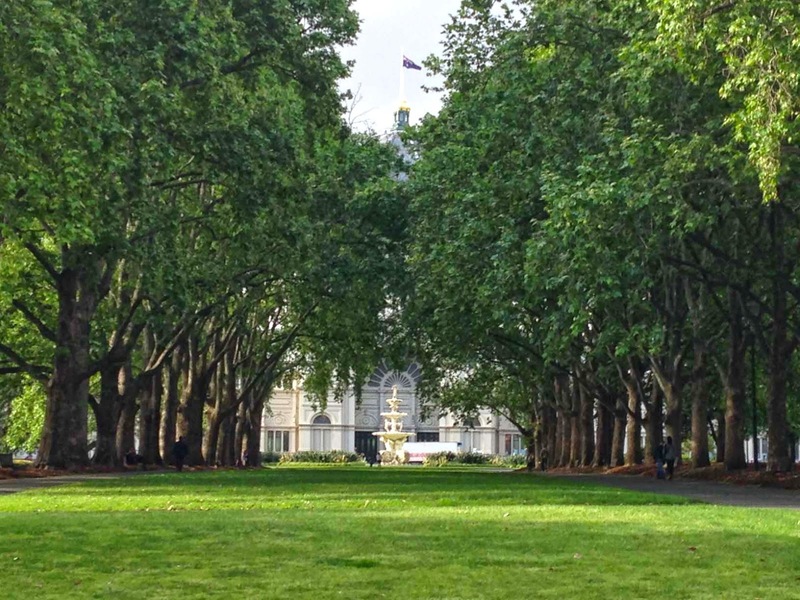 Run north through the park, along the tree-lined alley towards the domed Royal Exhibition Building. Now run around its left (west) side, with its adjacent modernistic Melbourne Museum and IMAX cinemas. Just past the museum entrance, turn left (east) onto Pelham Street in Carlton, where you'll run for six blocks. 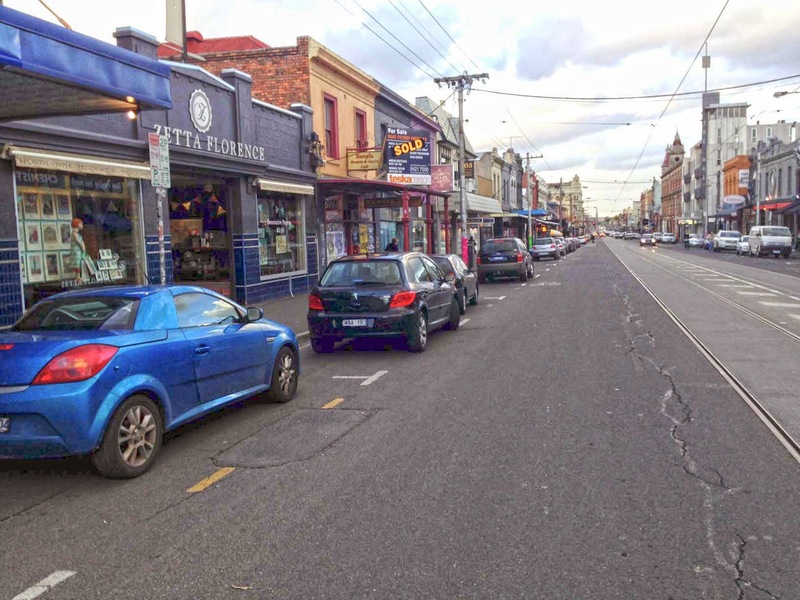 After two blocks, you cross Lygon Street and Little Italy, lined by one Italian restaurant after another. Most restaurants have outside seating: a great street to hang out in the evenings. I fell in love with Lygon Street as soon as I saw it in the evening, so take my tip and head out that way for dinner some time. The area's other university, RMIT, is just a couple of blocks south of here. 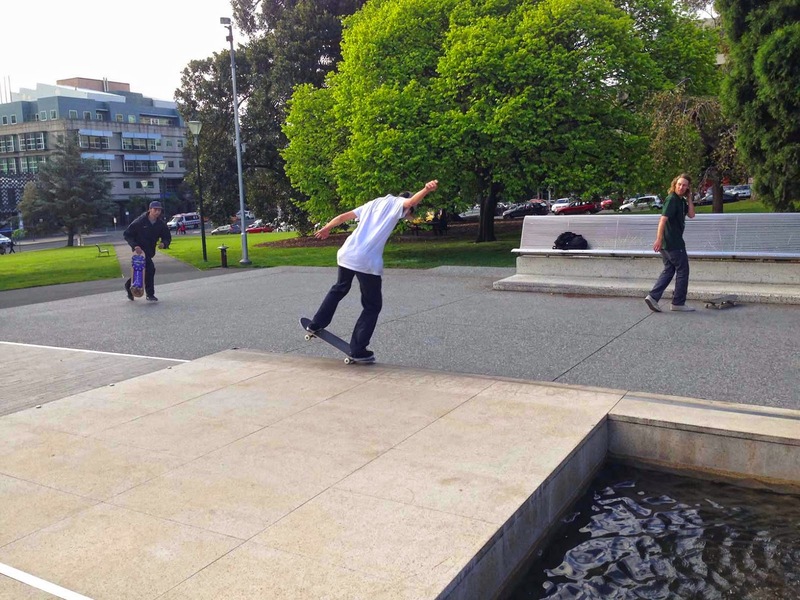 Across the street is Argyle Square, with its skateboarders. Then 2 blocks later you'll cross Lincoln Square. And in another two blocks, you'll arrive at University Square. 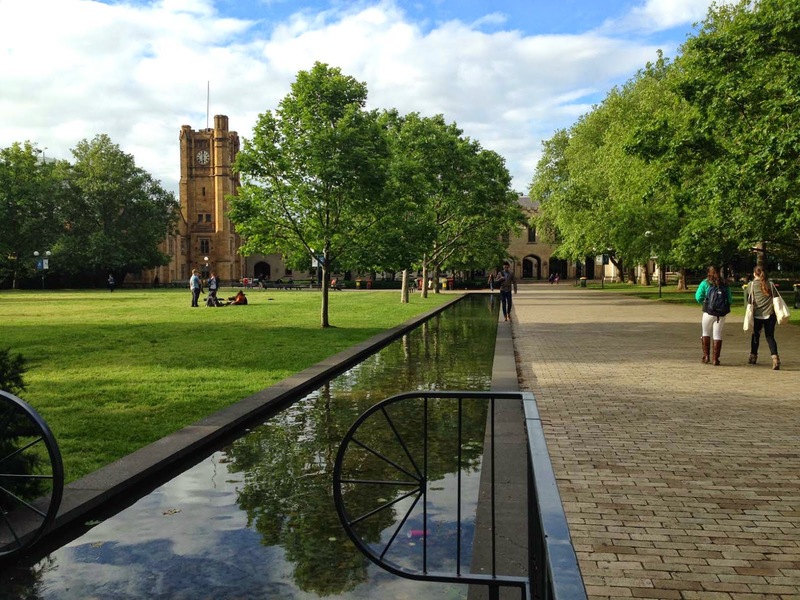 Here, turn right (northwards) at the fountain and run straight north towards the entrance of the University of Melbourne. The north end of the square looks like it is set up for concerts, and along the right side are beautiful row-houses. Cross Grattan Street and run past the gate-house and through the entrance into the university campus. Keep running straight, under the "Welcome" sign, going up a few steps, and onto the South Lawn. This is one of the nicest spots on campus. The oldest buildings surround the lawn: the library to the left, and the Old Quad straight ahead. Run towards the clock-tower ahead, then through the archway with the "1970" inscription to the right of it. 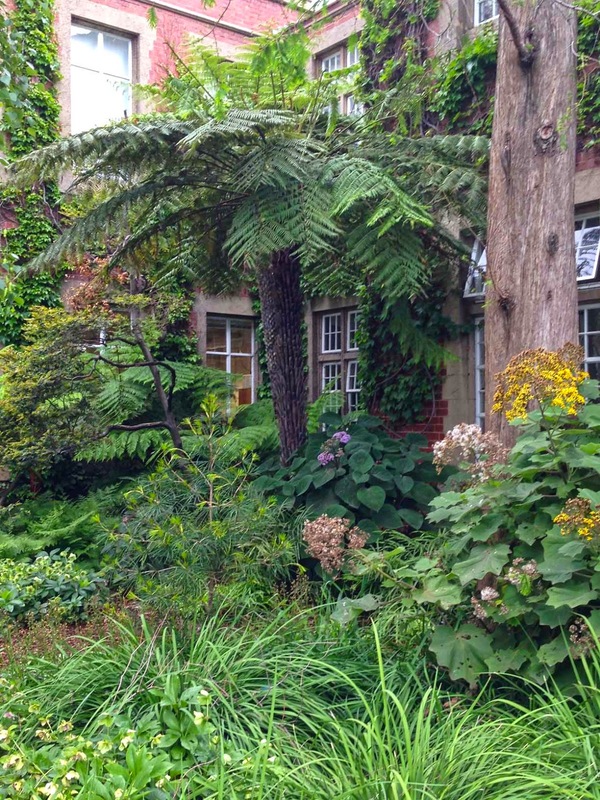 In the next little courtyard -- dominated by an exotic tree -- run along the left side and exit to the left. After a few steps, you'll come to Bank Lane, where you turn right and run past a few old botanic sciences buildings, with a lot more exotic landscaping. In just a few meters, at the north end of the street, your path will be blocked by the University House building, where you have to run around it along the right side. When you run past this building, you'll come to a sports gym, and a trail to its left side that continues northwards past the university sports fields. Head up that trail, with the running track to the right and more nice buildings on the left: Trinity College with its rose garden. Keep running north, past the cricket field on the right and the Gothic buildings of Ormond College, and the trail will turn onto a little street to the left, Morrison Close. 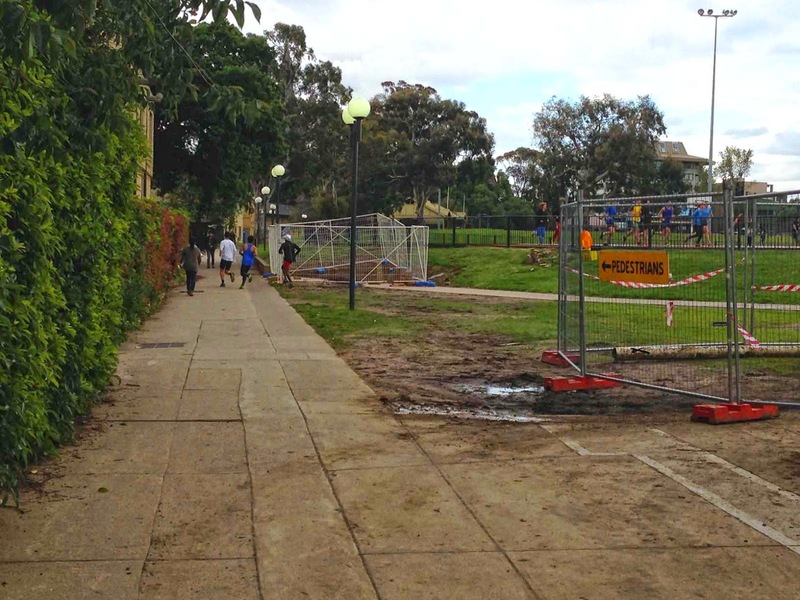 Now, run up Morrison and you'll exit the university campus at College Crescent. Now turn left and -- at the next crossing -- cross the street. This will bring you into one of Melbourne's biggest parks, Princes Park. So now we're out in parkland, with wider horizons, which feels great. 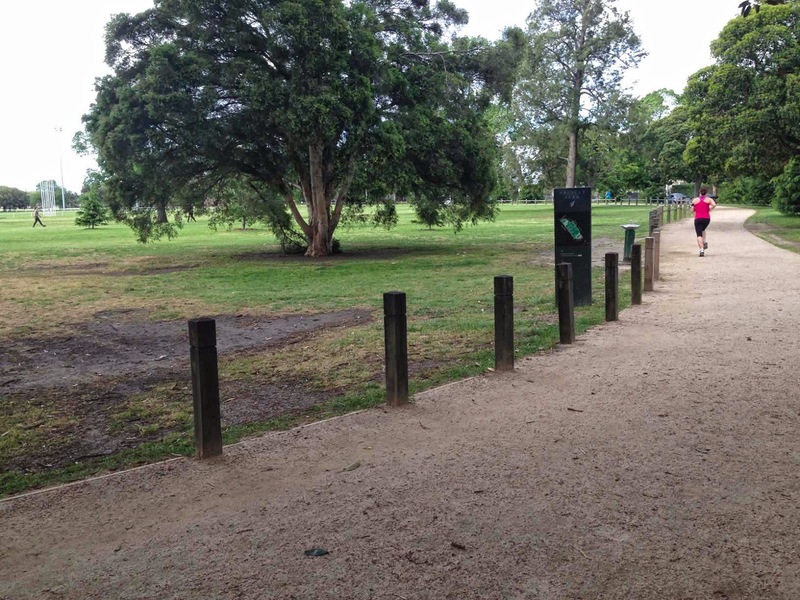 Run north along the wide dirt path along the west edge of the park, next to Princes Park Drive. The main cemetery is across the street to the right. Princes Park is part of a network of parks, including Royal Park and the zoo, stretching further west from here, and they're worth exploring sometime. This route, though, will turn east just before the cricket stadium, at the north end of the cemetery. Just continue following the cemetery fence eastwards along Macpherson Street, running past pleasant old cottage-homes on the left side. At the east end of the cemetery, back at Lygon Street, Macpherson continues a few meters further south, entering Fitzroy. Keep following Macpherson past more Federation-style homes for another seven blocks until you get to Nicholson Street. At Nicholson, again, turn right for a few steps, then turn left onto Brookes Crescent, running eastwards as it (becoming Watkins Street) curves to the left a bit. You will exit this little neighborhood at Brunswick Street, with its tram tracks. Cross Brunswick and run straight into the big park across the street, Edinburgh Gardens. There is a lawn bowling green to the right. Run straight into the park for 100 meters, past the tennis courts. Now turn right onto the next paved path heading south. You'll run past a cricket batting-practice field and continue southwards until you exit the park and continue along Napier Street. After a few blocks, you'll cross two busy streets, Queens Parade and Alexandra Parade. But just keep running straight south along Napier. Pass the little park, Smith Reserve (with a painted warning to bicyclists: "Slow Down: rug rats and elderly people all over the path"), and then head into the main Fitzroy neighborhood. 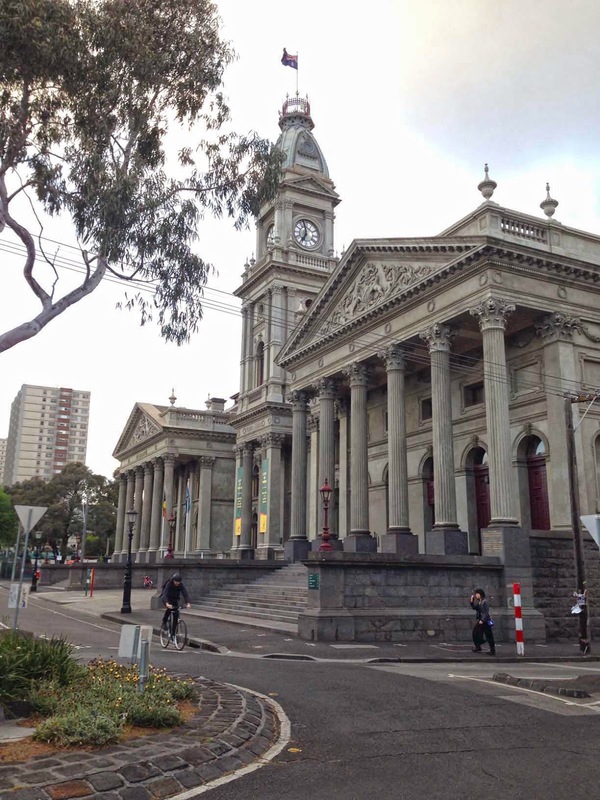 Continue to run south for another 12 blocks to the Fitzroy Town Hall, which looks like a combination of a Greek temple and a firehouse. Now turn right, along Moor Street. In two blocks, you'll be back at Brunswick Street. This section of Brunswick, as run-down as it looks, is one of the trendiest parts of town, full of clubs and restaurants. Keep running west along Moor Street, and in a few blocks you'll arrive at the northeast corner of Carlton Gardens again. Now turn left and run southwards along its east side, passing the Melbourne Museum and the Exhibition Building again from the other side. Now head through the shady middle of the park to the starting point on Victoria Street.